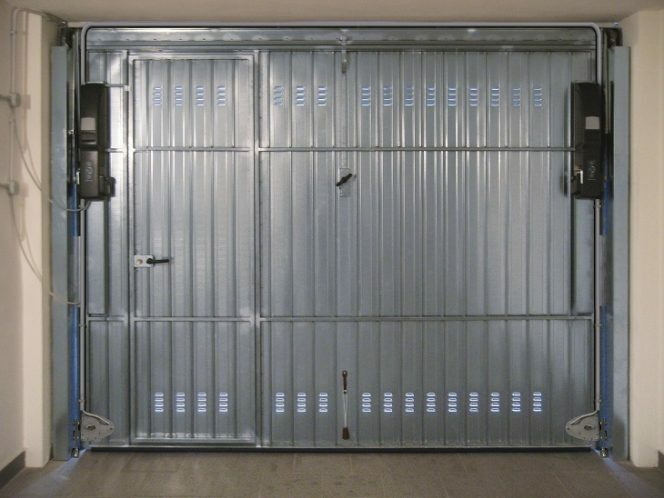 The motorized doors for garages, as we have seen in this article, require additional protection, bearing in mind that sliding doors, up-and-over doors and folding doors need different security systems. 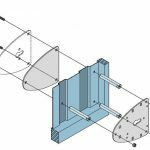 In the previous article, for example, we mentioned the V09 electric lock for the protection of folding doors and sliding gates. 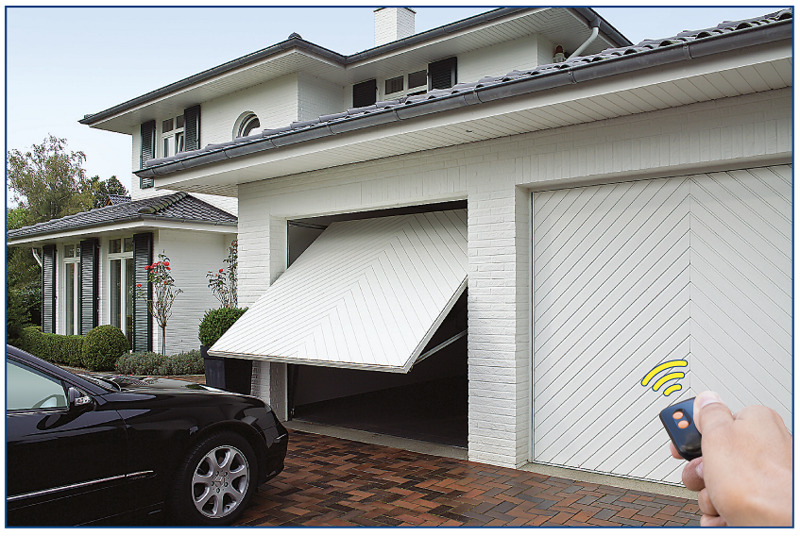 Today, on the other hand, we will talk about how to best protect automatic up-and-over doors. 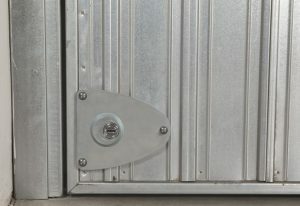 the galvanized steel fixing plates allow the installation of the V06 or 9087 lock on the up-and-over door, connecting them to the control unit via cable. Thanks to this solution you can continue to use the same remote control for operation of the door also to unlock the lock without having to get out of your car to open it manually, as is the case with normal mechanical locks. Automatic opening of door and lock with the same remote control. 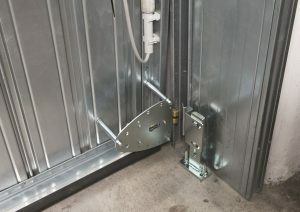 The main photo shows the application of the V06 lock on a motorized up-and-over door and the details are shown below. 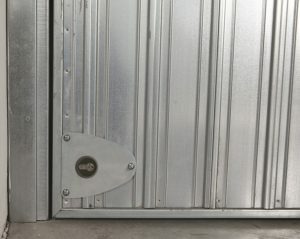 Detail of the closing phase of the V06 electric lock on a motorized up-and-over door. 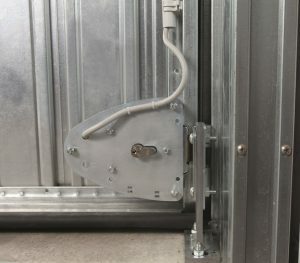 Application detail of the V06 electric lock on motorized up-and-over door. In the event of a power failure, the double cylinder option proves useful for manual opening even from the outside. 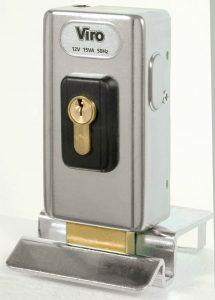 Provided with a rotating deadbolt, placed at the centre of the lock, and set up for any double or half cylinder profile, thanks to their characteristics, the V06 and 9087 locks allow a very flexible application: either horizontally or vertically on double-leaf gates, and laterally to the right or left on motorized up-and-over doors. 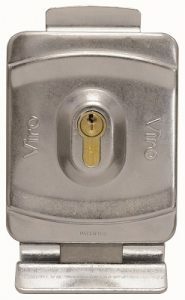 A sturdy T-shaped steel column, anchored to the ground with suitable standard plugs, houses the deadbolt once the lock is closed, preventing it from being lifted from the outside. 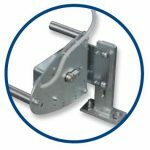 A new optional electrical connection kit is available for each electric lock, combined with the motors for up-and-over doors without direct power supply control. 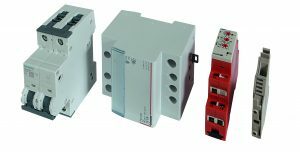 The kit consists of: transformer, timer, differential thermal switch, fuse holder and closing plate. New optional kit (item 1.7918.0850) for the electrical connection of the locks to existing automatism. It should also be noted that the V06 and 9087 electric locks are also ideal for the application on automated double leaf gates. 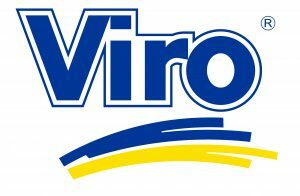 For more details, see data sheets V06 and 9087.